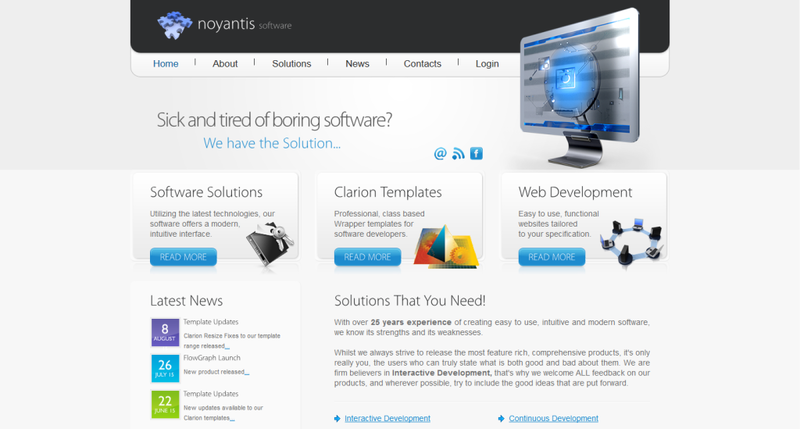 Sick and tired of boring software? Their range of Codejock Wrapper Templates for the Clarion development environment make adding the Codejock controls a breeze. Any of the controls can be added to a Clarion application within a matter of minutes. Their multi-engine PDF wrapper template enables you to add a simple viewer to your application in seconds, without the headache of worrying which commands to use with which engine! Something as simple as a popup calculator is what gives an application that extra bit of zip! Ease of use and a variety of visual styles including both simple and scientific add up to be the very best calculator template! Now you can add HTML viewing/editing capabilities to your application in minutes using the nBit wrapper templates. Built in functions include Table editing, CSS support, Spell Checking and FTP capabilities. Let’s face it, adding Audio, Video or Image Media content within applications can greatly enhance their appeal to the end user, and now its never been easier to a add a simple to use viewer to your app! The wrapper template supports 8 popular Media engines. “I honestly have to say it is the best investment we have ever made. The Codejock OCX controls provide the Clarion Developer with a solid set of highly customizable user interface components that allow the construction of a very professional modern User Interface with the recognizable look-and-feel of Microsoft flagship applications. Noyantis makes a great thing even better with their line of Codejock Wrapper Templates, you can quickly deploy the CJ controls and the methods within the template classes allow you complete control to GET or SET properties, call CJ Object Methods or just tweak to your heart’s content. A most excellent source for Instructional Documentary Coding Drama, tips and tricks. Where else can you go the see the current Clarion issues being sampled, discussed and coded out by you peers in a webinar? Here and only here will you find the ultimate collection of videos of Clarion knowledge. You can’t get any better than this! A special thanks to John Hickey and Arnold Young for hosting the weekly and the various user group webinars. BTW, If you have some Clarion expertise to share, go there and contribute. 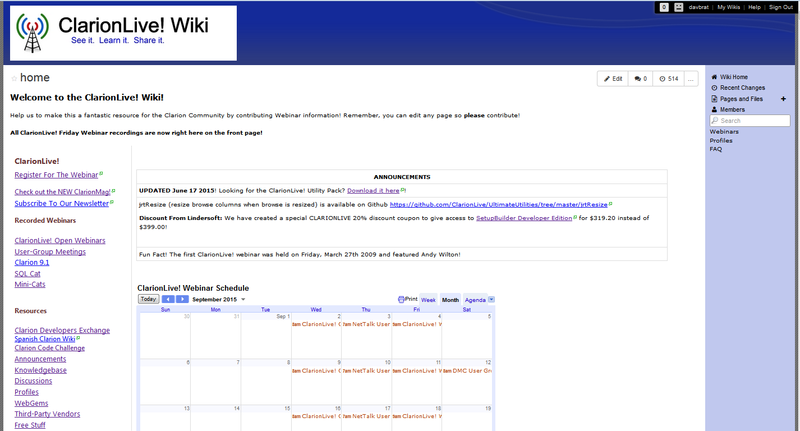 A new source for Clarion information that is built upon the Discourse discussion platform. It is an experiment to see if it makes any sense for the Clarion community as an alternative to the old news groups. 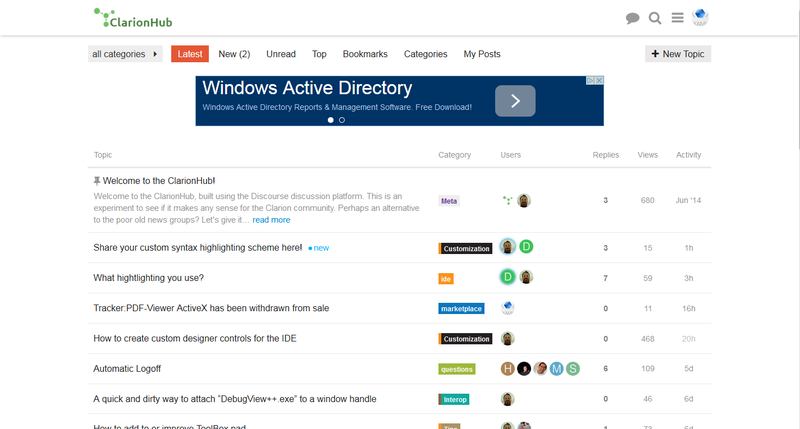 It’s a fresh free form exchange of “Clarion”, expressed through discussion topic categories, these include (but not limited to) Community, Tips, Code, Marketplace, Questions, Meta, IDE, FAQ, Docs and more. 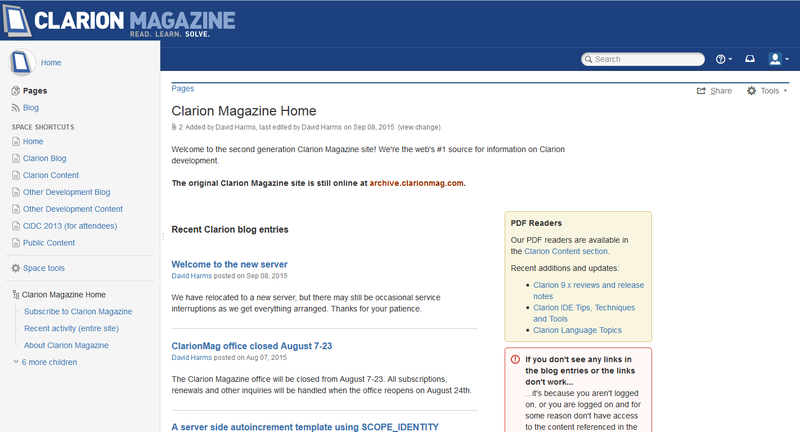 A Clarion eZine site that is one of the original Clarion knowledge centers. It’s primarily a Clarion developers resource, but they do have content for other development tools as well. They have an awesome online Clarion article archive. This is on the top ten “must visit” Clarion sites list. Knowledge is power, subscribe and go get it!